This post is dedicated to Quake God Ray the hidden hand who financially supported the Quake 2 history project. Thank you for all you have contributed! I pretty much play 1 game at a time, but when I do, I play it seriously, and play it hard! I am known worldwide as "Mr.Magoo" and can be found hanging out in irc.enterthegame.com channel #cLockwork with my clanmates and friends. I am currently one of the leaders of clan cLockwork. -Alex B.
Lan parties are a blast. It's a great excuse to get out of the house for 24 hours and play some online games with no lag at all. It's also a great time to swap software and collect MP3s. Here are pictures of the first lan party we had at our new house. Also there are new pix up from LanDiegoX here. This blog post is dedicated to Christina and Eliot, big fans of the retro games. I remember getting to the 10th "eggwave" (beyond level 50) in 2 player Joust with Eliot. Its totally possible we got way farther than that but as one of my proudest gaming achievements I do not want to overstate it. 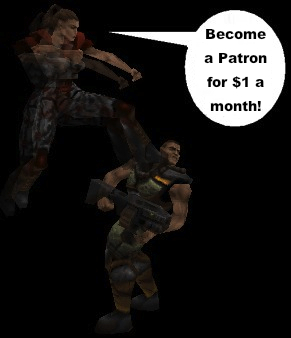 Thank you for supporting my Quake 2 gaming history videos on Patreon! A legendary broadcaster, who I have been listening to since I was in my first job, late night dishwasher at a fine dining club in Chicago, passed away this past weekend. Nick Michaels introduced me to a ton of music that I would never have heard otherwise, and with his contextualization and thoughtful approach and delivery, made that awesome classic rock sound even better. I have no doubt that the spirit lives on, in the Deep End.